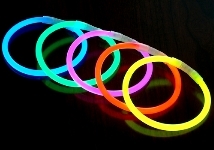 Premium 8" Glow Bracelets come 100 pieces per tube.� You get 100 bracelets (20 each of 5 colors) for $16.75. Premium Mix color 8" Glow Bracelets come 100 pieces per tube w/ connectors. Very bright colors last up to 12 hours and are known to last longer. Mixed colors in Blue, Green, Orange, Pink, and Yellow.